It is important to take a longer term view of global economic prospects that looks beyond the short-term ups and downs of the economic and political cycle, which are indeed very difficult to forecast. 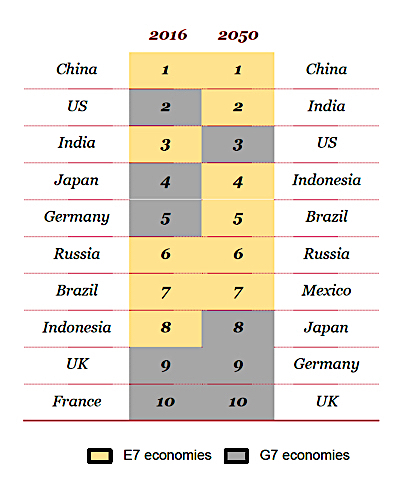 The firm of PricewaterhouseCoopers, a multinational professional services firm, has just published a report on "The Long View - How will the global economic order change by 2050?" 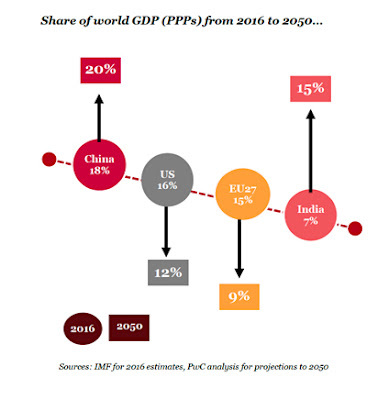 (https://www.pwc.com/gx/en/world-2050/assets/pwc-world-in-2050-summary-report-feb-2017.pdf). The data from the PWC report are used for this posting. America has progressed through the 19th and early 20th centuries to become the largest economy in the world despite a civil war, various other conflicts with foreign powers, three presidential assassinations and numerous economic and financial crises. Innovation, technology and superb financial management helped the US and related global economic growth to bounce back strongly from two world wars and a Great Depression to reach record current levels in the post-war decades. The world economy will more than double in size by 2050, far outstripping population growth. Consequentially, the stage has been set for a rearrangement in the global economic order. The GDP ranking of countries will improve for Indonesia, Brazil, Mexico, Turkey and Nigeria. Japan, Germany, France and South Korea will lose. As result the scope and directions of international trade will be different from present flows of goods and services. We show a decline in the population of Poland, Russia, Germany, Italia and Japan. These are all countries that were directly affected by WWII combat. Pakistan, Nigeria, Egypt, Saudi Arabia, Australia, Canada and the USA show population gains and tended to allocate a large share of government spending to social welfare. In the case of the last three countries a favorable immigration policy explains favorable population increases. 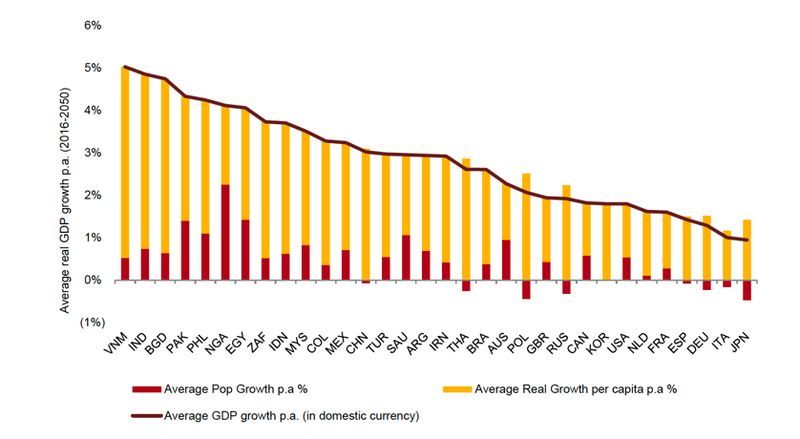 A rise in the average real per capita income is not reflected for wealthy countries. The average GDP growth per capita remains low fos USA, France, Germany, Spain and Japan. For the poorest countries such as India, Bangladesh, Pakistan and Nigeria, there are high gains while still keeping populations at low levels of real income. Such disparities suggest that international trade must include not only goods and services but also capital funds that support investments in productivity gains andd infrastructures. The world economy of 2050 looks similar to the current environment. Although diminished the USA, Australia and Europe will be keeping up their prosperity. 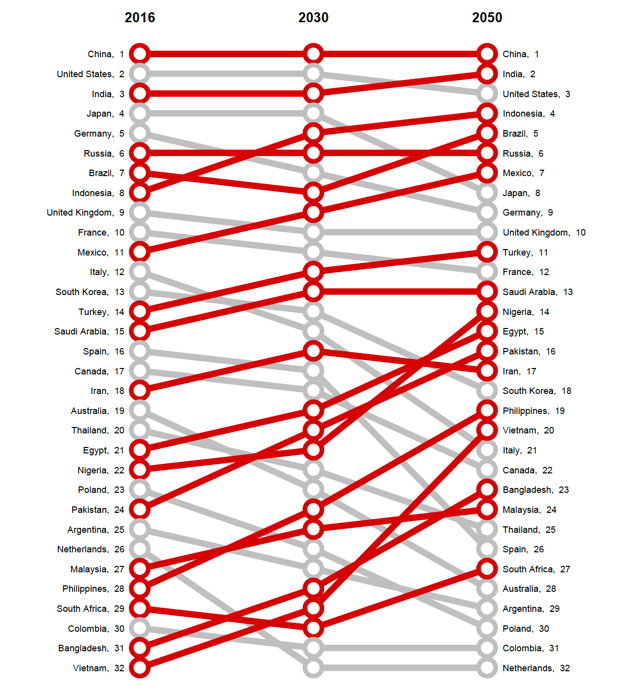 Countries such as China, India, Brazil, Mexico, Iran, Turkey, Argentina and South Africa will be gaining in income but not progressing to levels of prosperity that can be seen in countries that have already high level of economic achievement. 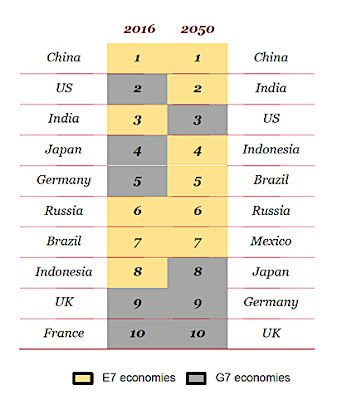 Emerging countries will be improving, but not sufficiently to achieve full economic potential. To realize high levels of prosperity the emerging markets countries need to implement structural reforms that would improve their macroeconomic fundamentals. A full potential that is available countries will have to undertake sustained investments in education. Adverse global conditions have highlighted the importance of diversified economies for long-term sustainable growth. Underlying all of this is the need to develop political, economic, legal and social institution that will generate incentives for innovation. That is needed to support the future of a knowledge-based economy on which the next stage of our civilization will be based.